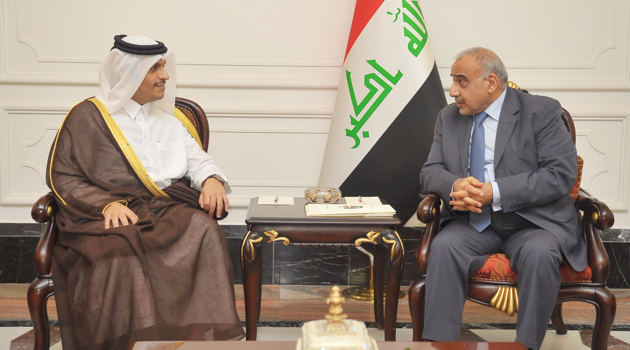 ERBIL (Kurdistan 24) – Iraqi Prime Minister Adil Abdul-Mahdi on Monday stated his country’s willingness to develop ties with Qatar as he met with a senior economic delegation from the Gulf state, which suggested a free trade deal with Baghdad. The meeting was held just days after a similar visit to Iraq by a Saudi Arabian delegation, comprised of various business interests and spearheaded by the kingdom’s commerce minister. In mid-2017, Saudi Arabia, along with three other Arab states, severed ties with Qatar for its continued dealings with Iran and allegedly supporting terrorism. On Thursday, delegations from Saudi Arabia and Iraq studied ways to boost bilateral trade ties and agreed to reopen a border crossing between the two countries to facilitate the movement of goods.